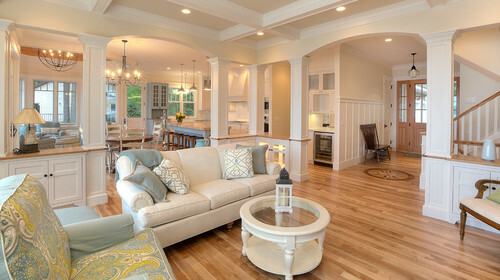 Remodeling can require extensive planning and detailed preparation. 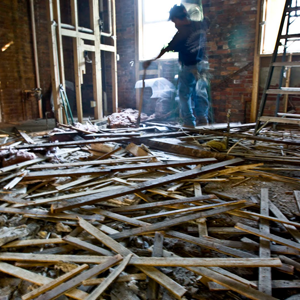 It is important to be prepared and know what to expect when doing an extensive remodel, renovation, or addition to your home. There are a lot of moving pieces and phases that will take place in your home. Some of which are disruptive, noisy, and dusty. There are also certain stages of the project that will seem as if progress and production have come to a standstill. It is frustrating to a homeowner when the framing work goes up in a matter of weeks and, more or less, the entire structure has been built but then progress seems to come to a complete halt. The stages of getting the different trades through the home for the plumbing rough-ins or the HVAC can often seem to drag on and on the surface look like little is being accomplished. There can also be delays that are unavoidable. Shipment of materials are late or incorrect, horrendous weather, or in the process of demo- some misfortunate discoveries were made inside the walls and the design/layout has to be adjusted to account for what was found, etc. There are a lot of variables and unknowns with these projects and at times there will be disappointments. Talk to your contractor about the subsequent phases that will be taking place throughout your project and find out what to expect or prepare yourself, family, and house for. 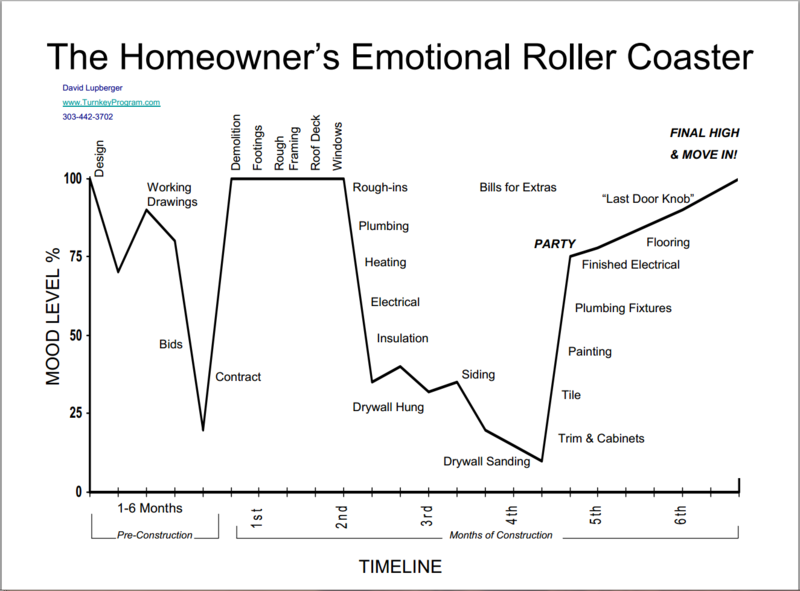 The chart above is something that can show you what areas and phases are the most testing on a homeowner’s patience and nerves. This was something that was put together by David Lupberger, who was a remodeling contractor for over 20 years where he had great success in creating the best experience possible for his clients. Through his experience in the industry he has, more or less, created a blueprint for managing a homeowner’s emotions during a project. He stresses the importance of a contractor being consistent, communicative, and customer service driven. He has written several books and guides to help others in the business get more repeat business and referrals by way of creating positive experiences with their clients. He also travels around the country consulting small business owners and speaking at conventions. Something important that can be drawn from his message is that communication is a major component in making a project run smoothly. Contractors must put themselves in the homeowner’s shoes and lay everything out clearly for them so they know what they can expect to happen in their house. Also, it is just as important that a homeowner can put themselves in the contractor’s shoes. It imperative to create an open line of communication between the two parties that welcomes constructive feedback and teamwork to run a smooth, successful remodel.